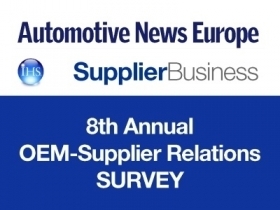 The 8th annual Automotive News Europe/SupplierBusiness OEM-supplier relations online survey is underway. Suppliers around the world are invited to take part in the survey, which asks partsmakers to rate their automaker customers on everything from commercial aspects to organizational issues. The survey runs until June 1, 2012, and can be found at www.supplierbusiness.com/relations. All participants receive a copy of the final survey results, which will be highlighted by the SuRe index, a performance metric for OEM-supplier relations developed by SupplierBusiness. The results will be presented at the Automotive News Europe Congress in Monte Carlo, Monaco, on June 21.